Between cardiac chambers, namely the atria and the ventricles (mitral and tricuspid valve). Stenosis of aortic | mitral | pulmonary | tricuspid valve. Regurgitation of aortic | mitral | pulmonary | tricuspid valve. The commonest cause of valvular heart disease in the developed countries is degeneration due to age. Other causes are rheumatic fever, infective endocarditis whereas indirectly valvular heart disease can be caused by arterial hypertension, myocardial infarction, and heart failure. In case when a valvular disease is present since birth then it is classified in congenital heart disease. Degenerative aortic stenosis is caused by risk factors similar to coronary artery disease, namely high blood cholesterol, diabetes, arterial hypertension, smoking, etc. and is usually diagnosed in patients over 70 years old. Congenital aortic stenosis is caused by an anatomic defect of the valve, which, instead of three, has two or one cusp (bicuspid or monocuspid aortic valve) and usually causes symptoms in the age of 30 – 60 years. Its etiology is unknown. Aortic regurgitation could be caused by cusp distraction (due to degeneration, arterial hypertension, infective endocarditis, rheumatic fever, trauma, etc.) or by dilatation of the aortic ring that surrounds the cusps due to dilatation of the initial part of the aorta (aortic root dilatation. Congenital aortic valve regurgitation can be present in case of bicuspid or monocuspid aortic valve or in inter ventricular septum defect. Very often, mitral stenosis is caused from rheumatic fever, a rare disease in the developed countries. Mitral regurgitation can be degenerative or functional. 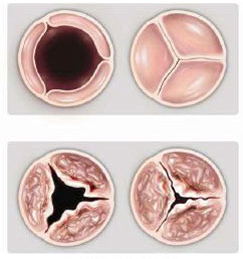 The degenerative form is caused by calcification of the valve cusps, with risk factors similar to those of coronary artery disease (high blood cholesterol, diabetes, arterial hypertension, smoking, etc.) or, less often it can be caused by rheumatic fever. The functional form is caused by dilatation of the mitral annulus, due to distension of the left ventricle of the heart (after myocardial infarction or patients with heart failure) or a papillary muscle dysfunction (who holds the cusp), due to ischemia. A special case in which there is mitral valve regurgitation is mitral valve prolapse. It is a connective tissue disease due to relaxation of the tissue (chordae tentae) connecting one of the two leaflets to the corresponding papillary muscle. The most common form is congenital pulmonary valve stenosis, and very rarely it is caused by rheumatic fever. Typically, pulmonary valve regurgitation is caused by dilatation of ring that surrounds it in pulmonary hypertension and pulmonary artery dilatation. Less often it is due to infective endocarditis. Tricuspid valve stenosis is almost universally caused from rheumatic fever, a disease that, nowadays, is very rare in developed countries. The most common cause of tricuspid regurgitation is dilatation of the right ventricle in pulmonary hypertension and / or right heart failure. Less often it is due to infective endocarditis. The symptoms of valvular heart diseases vary depending on the valve that suffers and on whether the disease is acute or chronic. Common symptoms are shortness of breath on exertion, palpitations, angina (chest pain), and swelling legs whereas, rarely, hemoptysis or syncope can occur. It is worth noting that in many cases patients with valvular heart disease, even severe, have almost no symptoms. The initial investigation of a valvulopathy is done by history taking and physical examination. Today, the final diagnosis is almost always put with transthoracic echocardiography. In some cases when we must take more detailed images such as in mitral valve regurgitation or suspected infective endocarditis a transesophageal echocardiography needs to be done (an examination that resembles an endoscopy). Very rarely, finally, a CT scan, MRI or cardiac catheterization may be needed. In many cases the valvulopathies are treated conservatively with medication, but when the disease progresses the treatment is typically surgical. What does interventional cardiology has to offer in valvular heart disease? Nowadays, it is possible to do an aortic valve replacement through a catheter, without surgery (transcatheter aortic valve implantation, TAVI). The method is currently available for patients who are too high risk for open-heart surgery or for those who are considered inoperable. Also, a new noninvasive technique for repair of severe mitral valve regurgitation has been developed, again for patients who cannot be operated on (MitraClip). Finally, a prosthetic pulmonary valve can be percutaneously implanted in patients who have had previous surgery for congenital heart disease. (Intervention through catheters – Melody).